Donald Trump has cancelled a visit to Britain next month to open the new US embassy in London, amid fears of mass protests. The president claimed on Twitter that the reason for calling off the trip was his displeasure at Barack Obama having sold the current embassy for “peanuts” and built a replacement for $1bn (£750m). “Bad deal,” he wrote. But the embassy’s plan to move from Mayfair to Nine Elms in London was first reported in October 2008, when George W Bush was still president. 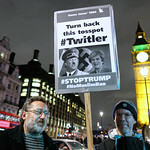 The London mayor, Sadiq Khan, said Trump had “got the message” that many Londoners staunchly opposed his policies and actions.